24 cm vii, 225 p. : ports. Reprint. Transferred to digital printing. Originally published: 1994. Cultural studies started life as a radical political project, establishing the cultural centrality of everyday life and of popular culture. In a postmodern world where old uncertainties are undermined and identities fragmented, the way forward for those working with popular culture has become less clear. In contrast to more pessimistic readings of the possibilities of postmodernity, "Postmodernism and Popular Culture" engages with postmodernity as a space for social change and political transformation. ;Ranging widely over cultural theory and popular culture, Angela McRobbie views everyday life as an eclectic and invigorating arena for the interplay of different cultures and identities. She discusses new ways of thinking developed with the advent of postmodernism, from the "new times" debate to political strategies after the disintegration of western Marxism. 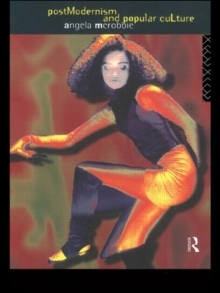 She assesses the contribution of key figures in cultural and post-imperial theory - Susan Sontag, Walter Benjamin and Gayatri Chakravorty Spivak - and surveys the landscape of today's youth and popular culture, from secondhand fashion to the rave scene, and from moral panics to teenage magazines.